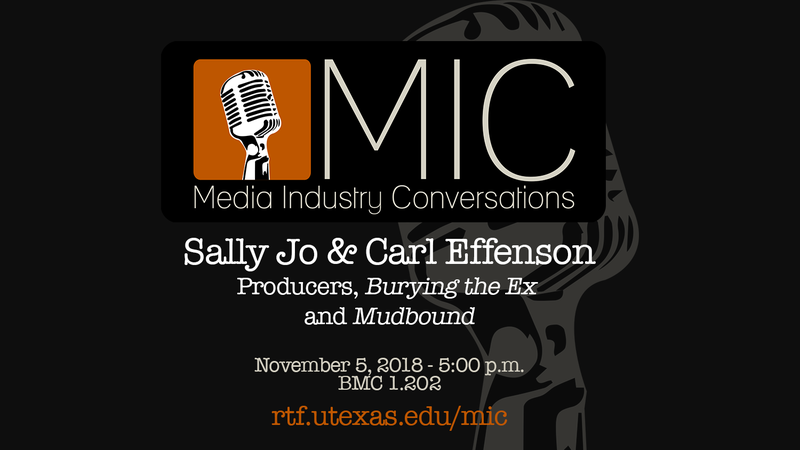 When: Monday, November 5, 2018 - 5-6:15 p.m.
Mudbound producers Carl Effenson and Sally Jo Effenson discussed their career trajectories, their roles and responsibilities as producers, and their views on the current state of the film industry. Carl Effenson was exposed to the film industry at an early age, working first as a production assistant in the Texas production circles. An avid film lover, he went on to receive his degree from the University of Arizona. His first producing effort, Hide Away was directed by Chris Eyre (Smoke Signals) and starred Josh Lucas and James Cromwell. The picture debuted at the 2011 SXSW Film Festival winning a Grand Jury prize for Best Cinematography. Carl’s follow up feature, Burying the Ex was directed by legendary filmmaker Joe Dante (Gremlins, The Burbs) and starred Anton Yelchin, Ashley Greene, and Alexandra Daddario. The picture premiered at the 2014 Venice Film Festival and was released by Image Entertainment. Carl recently developed and produced Mudbound. The film was directed by Dee Rees (Bessie, Pariah) and starred Carey Mulligan, Jason Clarke, Jason Mitchell, Garrett Hedlund, and Mary J. Blige. Netflix picked up worldwide rights in a historic deal out of the 2017 Sundance Film Festival. The film was the opening night selection of the 2017 AFI Film Festival and screened at the Toronto, London, and New York Film Festivals. Mudbound went on to be nominated for 4 history- making Academy Awards including Best Adapted Screenplay, Best Supporting Actress, Best Cinematography and Best Original Song. The film was the recipient of the Robert Altman Award at the 2018 Independent Spirit Awards. The film also received 4 Critics Choice nominations, 2 Golden Globes nominations, 2 SAG nominations, as well as the Humanitas Prize among other awards and accolades. He is currently working on an adaptation of Benjamin's Crossing written by Jay Parini (The Last Station) and Something in the Water written by Cindy McCreery and Trey Fanjoy with renowned country music video director Trey Fanjoy at the helm and country music superstar Miranda Lambert Executive Producing. He resides in Austin, Texas. Producer Sally Jo Effenson embodies the grit and grace of women in film. While a single-mother raising four young children, Sally Jo began her film career under the tutelage of acclaimed director and fellow Texan Peter Masterson (Academy- award winning Director, The Trip to Bountiful). While supporting the formation of the independent film production company Masterson Films, Sally Jo was responsible for project acquisition and development. As Texas-based projects grew with major film crews sprouting up in Austin, TX, Sally Jo served as Vice-President to an entertainment division of a capital venture firm, identifying projects for investment and overseeing acquisition and development. While focusing on family, Sally Jo led a marketing initiative for musical artist Neil Young. The project, an experimental film Greendale, began with positioning the piece for theatrical distribution with exposure in the film festival circuit. The film premiered at the 2003 Toronto International Film Festival where it received key critical acclaim. Greendale was independently booked in over fifty theaters nation wide. Sally Jo established MMC Joule Films in 2008, producing and arranging financing for its first feature Hide Away in 2009 (Josh Lucas, James Cromwell, Ayelet Zurer). The film debuted at the SXSW Film Festival where Director of Photography Elliot Davis (Twilight, I Am Sam, Out of Sight) was the recipient of the respective Cinematography award. Joule Films’ next project maintained indie roots, but broke away from art house with a fun horror, rom-com. Burying the Ex (Ashley Greene, Alexandra Daddario, Anton Yelkin), was produced in 2012 in conjunction with Artimage Entertainment and Voltage Pictures. Directed by Joe Dante, the film was shot in Los Angeles, and made its debut at the 2014 Venice Film Festival. Sally Jo and Joule Films next brought Hillary Jordan’s award-winning Mudbound to life, serving as the original producer of the critically acclaimed, now Netflix picture. Sally Jo optioned the novel Mudbound and commissioned the screenplay written by Virgil Williams. She oversaw all aspects of its development, pre-production, and production. The projects stars Jason Clarke, Carey Mulligan, Garrett Hedlund, Jason Mitchell, Mary J Blige, Jonathan Banks, and Rob Morgan. Directed by Dee Rees and shot by Director of Photographer Rachel Morrison in New Orleans in May 2016, Mudbound was acquired by Netflix following its screening at the Sundance Film Festival 2017. Mudbound screened at the Toronto Film Festival, London Film Festival, New York Film Festival, among others and is the recipient of numerous critical awards and nominations, including four Academy Award nomination.